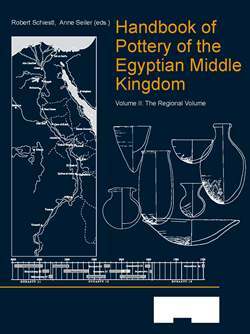 The Handbook of Pottery of the Egyptian Middle Kingdom is a comprehensive typological study of Egyptian pottery produced in the period of the Middle Kingdom (mid 11th to mid 13th Dynasty, appr. 2000–1700 BC) found in Egypt, Nubia and the Levant. The Handbook is arranged in two volumes: Volume I, the Corpus Volume, is a typological study based on pottery shapes. Volume II, the Regional Volume, discusses pottery in its site specific contexts. The focus of the Handbook is chronology. It is attempted to establish as fine dates as possible for pottery shape groups. The material presented in these volumes derives not only from published sources, but also from unpublished excavation reports and studies by numerous scholars. In addition, large amounts of pottery stored in museums were analysed and drawn in order to be presented in the Handbook. Volume I, the Corpus Volume, consists of four main classes: I. Open Vessels, II. Closed Vessels, III. Vessels for Production and Specific Household Use and IV. Miniature and Model Vessels. Opening the Handbook the reader will see on the left hand side a plate with a map of Egypt, a time line, a box with the basic information on fabrics, surface treatments, sizes, contexts and functions, a concise discussion as well as a bibliography of this particular shape group. On the right hand side, the drawings of the actual pieces forming this group are shown on one plate or more, providing an overview of all the formal variants of this shape group. Volume II, the Regional Volume, assembles 15 contributions by colleagues reporting on the pottery found in ongoing or recently completed excavations. These studies provide crucial information on contexts, quantity and regional aspects of pottery development. Coloured plates illustrate a regionally balanced group of vessels. Colour photographs of breaks of the fabrics of the "Vienna System" are shown, as well as two new groups of MK fabrics not included in the "Vienna System" so far – previously undiagnosed Upper Egyptian Marl clays and clays from the oases –are also presented.